The hospital where I deliver has always given gifts to the mothers when they deliver their baby there. For the first several children, we received baby books as the gift, along with the usual formula swag bags. I loved the baby books, but the hospital said that many didn't. A couple of babies back, I had a different gift when I delivered. It was a HALO SleepSack Swaddle. I have to admit, the first one I received I didn't even pay attention to. I actually ended up donating it because it seemed complicated and unnecessary. Last year, when I had Luke, we received another. Again, I didn't pay much attention at first, but this time it was because he was whisked off to the NICU without me. 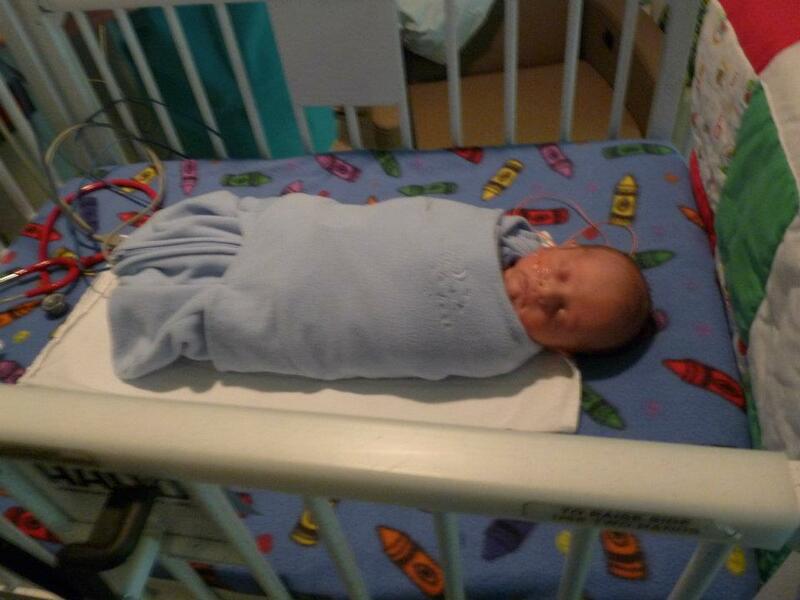 Once I was able to go to be with Luke, when he was doing a bit better, I noticed that they put him in these really neat blanket things. I didn't realize what they were yet, but I thought it was great because they kept him from pulling his G-tube and oxygen out. "HALO Innovation’s SleepSack® Swaddle has become the standard for hospital nurseries and parents alike. In fact, 1,000 hospital nurseries use the HALO SleepSack Swaddle instead of blankets through the HALO Safer Way to Sleep Initiative. That is 1.5 million births getting first-hand, in-hospital experience with the HALO SleepSack Swaddle and safe sleep practices! Leading health organizations agree that modeling proper baby care in the hospital is the single biggest influence on how parents care for their baby at home. HALO Innovations also offers free Safe Sleep Practices kits to childbirth educators to help further the cause of SIDS prevention." Once I checked out the neat swaddle thing, I realized it was a HALO SleepSack Swaddle, and then I realized I had one! I can definitely see why they are used in the NICU, they are SO helpful! Once I read more about them I realized how convenient these really were- and that they really weren't complicated. No worries about blankets in the crib that could suffocate the baby, super simple zipper access (from the bottom) for nighttime diaper changes, and no need for an extra swaddle blanket! When I had Orrin, I was glad to see that the HALO SleepSack Swaddle was a gift again. Although we didn't have to deal with the NICU and the cords and tubes this time, I knew that the chilly fall evenings that will be coming up would cause need for the HALO SleepSack Swaddle. What I didn't realize is that Orrin would quickly outgrow the newborn size SleepSack that we received! 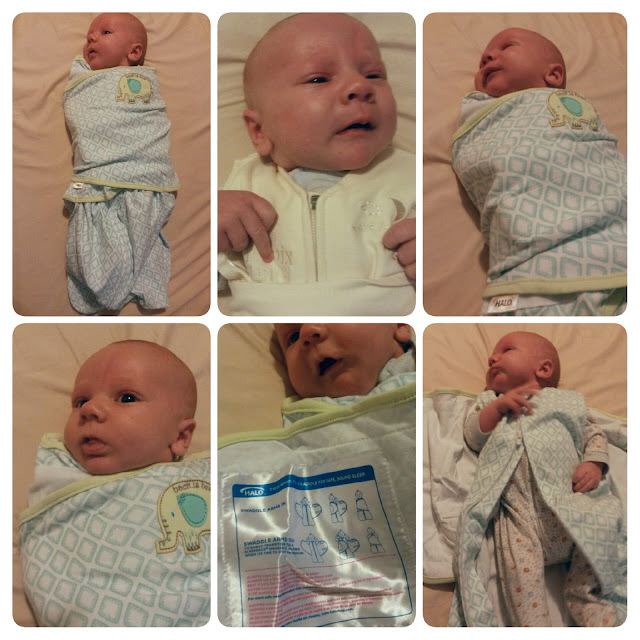 I was happy to have the chance to review a larger SleepSack Swaddle! HALO sent me a really fun SleepSack Swaddle in the small size. I would say the biggest difference in the newborn size and small size is the length. The small is significantly longer than the newborn size and should fit Orrin until he's at least 6 months old. The SleepSack Swaddles come in several colors and prints. We were thrilled to get one we received since I had only seen the plain colored SleepSack Swaddles. I absolutely LOVE the cute little elephant and the fun colors. We love green, but this pattern is so much better than just simple green! Another thing that is great is that the instructions for use are ON the product- you can't lose them! You can use the SleepSack Swaddle two ways, arms in, or arms out depending on which your baby prefers. The elephant reminds you to put the baby "back to sleep" for safe sleep. While the washing instructions are pretty simple, machine wash with like colors close fastener straps before washing. As long as you remember that last step- you're golden (no really... don't forget to do this). The HALO SleepSack Swaddle is a great way to keep your infant warm and secure during sleep without the fuss or danger of an extra blanket. HALO is hosting a Baby of the Week Photo contest on Instagram for parents of babies born in a HALO hospital- check it out if your baby was born in a HALO hospital! HALO SleepSack is offering one reader a SleepSack Swaddle! Enter below for your chance to win! The Pup Pals design is my favorite. The sleep sack was a lifesaver when I my baby was little. I highly recommend a halo sleep sack. I have never used one sadly. If I won I would choose the Cupcakes print. The micro fleece pup pals is my favorite, although the cupcakes are cute too!